1) In those days Mattathias, son of John, son of Simeon, a priest of the family of Joarib, left Jerusalem and settled in Modein. COMMENTARY: Modein is his ancestral home, around twenty miles north of Jerusalem. COMMENTARY: Apparently all of these nicknames have significance, so I will try to track them down. It can either mean “My Troop” or “Kid Goat.” I think the former is probably the intention, consider the militant nature of this family. COMMENTARY: Thassi most probably means “Guide” or “Director”. You will notice that later he’s looked to for advice. COMMENTARY: As we mentioned before, his nickname means “Hammer”. 5) Eleazar, who was called Avaran; and Jonathan, who was called Apphus. COMMENTARY: Avaran might mean “Piercer” and refer to an incident later where Eleazar stabs an elephant. Apphus might mean “Dissembler”, but it might have begun with any of several unwritten consonants that would have changed the meaning—or so my sources say, not wanting to admit that a Biblical Hero might be known as Jonathan the Liar. I wish this text had no greater problem than that! This is probably a good point to mention that the Bible is full of highly fallible people, and the Deuterocanonical Books are no exception. Just because somebody in the Bible does something doesn’t make it right. 11) All her adornment has been taken away. COMMENTARY: More classic Jewish-style poetry translated into the Greek, a lyrical lament summing up the grief from the last chapter. I feel for that last line—sometimes such terrible things happen that you wonder why the shock didn’t kill you. How is it that you can go about your daily business as though nothing had happened? Why didn’t your heart just stop? 14) Then Mattathias and his sons tore their garments, put on sackcloth, and mourned bitterly. COMMENTARY: Garment-tearing is a standard part of the Jewish mourning ritual. Some prudently aim for seams so that the garment can easily be sewn back again. Others go at it with abandon, and hang the cost; grief matters more than a shirt. In this case Mattathias mourns for all of the slaughtered. Sackcloth, as we mentioned before, signifies penitence, in this case for the sins that brought Jerusalem to this pass. Once you’ve finished wrecking your clothing, you need to put something on in its place, of course, but nobody’s in the mood for fine garments, and anyway, why not kill two birds with one stone and mix mourning with penance? 15) The officers of the king in charge of enforcing the apostasy came to the city of Modein to make them sacrifice. COMMENTARY: The enforcement starts to spread beyond Jerusalem to the nearby villages. Having made an example of Judea’s most important city, they don’t expect much resistance. 16) Many of Israel joined them, but Mattathias and his sons drew together. COMMENTARY: Some were already inclined that way, and some intimidated into it. 17) Then the officers of the king addressed Mattathias: “You are a leader, an honorable and great man in this city, supported by sons and kindred. COMMENTARY: If the officers can win over this influential man, they can get this done without bloodshed. COMMENTARY: “King’s Friends” was a kind of order of knighthood or nobility, based on Alexander’s Companions. Aristotle had not tutored Alexander all by himself, but thought it best to have other boys and teens study with him, so together they learned statesmanship, strategy, philosophy, and everything else necessary for leadership. So by the time his boyhood friends reached adulthood they were all qualified officers and advisors, as well as intimates who understood Alexander’s mind and intentions with little needed said. Subsequent rulers, throughout history, have tried to imitate having a similar order of King’s Friends, but they never quite duplicated the chemistry between these men who grew up with each other, or had a teacher like Aristotle. 19) But Mattathias answered in a loud voice: “Although all the Gentiles in the king’s realm obey him, so that they forsake the religion of their ancestors and consent to the king’s orders, 20) yet I and my sons and my kindred will keep to the covenant of our ancestors. COMMENTARY: The Jews were not the only people assimilated into the invader’s religion. Interestingly, Mattathias considers them shameful for not following their own gods; he’s not out to convert people of other heritage to his own people’s ways. People thought of ethnicity and religion as pretty much synonymous in those days. When you converted to a different religion, you left behind your old family for a new one. Christianity shook up that model and introduced the concept of evangelism to the Middle East, Europe, and Africa, where it had previously been unknown. (Buddhist evangelism does predate it, mostly influencing Asia.) The word “catholic” in the phrase from the Nicene Creed: “holy, catholic, and apostolic church” means “universal, which means for anyone of any ethnicity. The problem with that was that, in the Middle East and North Africa, vultures are symbols of mercy—the carnivore who refuses to kill. In Rome, eagles are symbols of conquest—the mightiest bird known to them, flying high above all others. Little things like this can make a big difference in people’s unconscious mindset. “Spreading the Good News” became less and less an offer of mercy and more and more an ultimatum at sword-point. The Catholic Church has, since then, confessed as a sin and repented all evangelism-by-force. This matters in considering the rest of this chapter. COMMENTARY: As you will see they will later have to pick and choose which customs to depart from in order to survive. Some of their choices might startle you, with odd priorities. But in each case they decide based on whatever’s most likely to keep their culture alive. 23) As he finished saying these words, a certain Jew came forward in the sight of all to offer sacrifice on the altar in Modein according to the king’s order. COMMENTARY: Maybe he was terrified and wanted to avert a massacre. Maybe he wanted all of that treasure and the name of King’s Friend. We don’t know for sure. But we can find a clue as to at least partial motives in him by how the writer names him—or rather doesn’t name him. To call him “a certain Jew” instead of just “a Jew” indicates that the writer knew exactly who he was talking about and refused to name him by choice. This has a precedent. On the same day that Alexander the Great was born, “a certain Greek” burned down the Temple of Artemis, declaring to all who would listen that this act would secure his position in history. Instead, , all who recorded the incident refused to preserve his name. From this we might conclude that “a certain Jew” was an ambitious or vain person, either a celebrity or a celebrity-wannabe enamored of becoming a King’s Friend, who’d very much want known, punished for posterity by having his identity blotted from the record. 24) When Mattathias saw him, he was filled with zeal; his heart was moved and his just fury was aroused; he sprang forward and killed him upon the altar. COMMENTARY: Okay, I have a hard time with that. I do NOT believe in killing people for making religious choices different from my own. But if this man was indeed ambitious, Mattathias probably saw his sacrifice as a public declaration of an intention to betray his people and cause much bloodshed, aiding the conqueror and informing on anyone who resisted, thereby amassing fame, wealth and power for himself. So the more I think about it, the more I see this as a defensive strike against somebody who exposed bad intentions. What I really have a hard time with is the historical precedent that this set, when taken at face value. Way too many people have died over the years because others could call it “my just fury” to kill them for believing something other than the local standard. 25) At the same time, he also killed the messenger of the king who was forcing them to sacrifice, and he tore down the altar. COMMENTARY: Right. Kill the messenger. Except that this messenger came with the power to have others killed, so I can understand that. 26) Thus he showed his zeal for the law, just as Phinehas did with Zimri, son of Salu. COMMENTARY: Now this justification REALLY makes me squirm. Earlier in the Bible a man named Phinehas saw a Jew married to a Canaanite and went into a rage and killed him. Modern times have seen the rise of a violent racist group called “The Priesthood of Phinehas”, which has been known to kill multiracials and people in mixed-race marriages, and they scare me more than the Ku Klux Klan or the Neonazis or any of the rest of them, because I am precisely the sort of person they would murder if they got the chance. I don’t like the idea of anybody emulating Phinehas! But I’m not here to gloss over the parts I don’t like. That’s dishonest. If I disagree I’ll say so, and sometimes, like right now, I’ll say so loudly. But I won’t conceal or try to rationalize any part away. I will say that those were barbaric times, all over the world, among all peoples. Our understanding of God’s will lives and grows over time. Jews have developed the Talmud and other great works of scholarship to reflect an evolving understanding; no sane Jew would justify murdering an apostate today. Nor can Christians deny religious evolution, as we have founded our faith on an innovation that separated it from traditions that went before. And we Catholics have a Pope to make rulings on evolving faith and circumstances. This rationalizes nothing. It is not God who changes, nor what is right and wrong, but rather our understanding. COMMENTARY: Thus Mattathias becomes the spark for a movement. 28) Then he and his sons fled to the mountains, leaving behind in the city all their possessions. COMMENTARY: Movements often erupt without plan. If Mattathias had intended a show-down, he would have stocked up some hidey-hole in advance. 29) At that time many who sought righteousness and justice went out into the wilderness to settle there, 30) they and their children, their wives and their animals, because misfortunes pressed so hard on them. COMMENTARY: The wilderness where they went lies south of Jerusalem and west of the Dead Sea, a sparsely populated region, hard to grow food in—the same region, in fact, where the Dead Sea Scrolls were found. Mind you, the Dead Sea Scroll writers did not approve of the Maccabees or consider their books scripture, but apparently this rugged land abounds in bolt-holes for dissidents of any flavor. 31) It was reported to the officers and soldiers of the king who were in the City of David, in Jerusalem, that those who had flouted the king’s order had gone out to secret refuges in the wilderness. COMMENTARY: It’s no use, really, to kill messengers; more always crop up in their place, wherever there’s a story to be told, for better or for worse. COMMENTARY: Keep in mind that one of the customs that they want to preserve is to do no labor on the Sabbath. 35) Then the enemy attacked them at once. 36) But they did not retaliate; they neither threw stones, nor blocked up their secret refuges. COMMENTARY: Because that would mean working on the Sabbath. COMMENTARY: It is significant to me, as a Christian Animist, that they called on Earth to bear witness. 38) So the officers and soldiers attacked them on the Sabbath, and they died with their wives, their children and their animals, to the number of a thousand persons. COMMENTARY: And thus they died on their own terms, rather than become something they were not. 39) When Mattathias and his friends heard of it, they mourned deeply for them. COMMENTARY: Not least because he put them up to it. That’s a heavy responsibility, provoking much thought, as you will see. COMMENTARY: And thus they tempered their earlier declaration that they would not violate a single tenant of the law. Sometimes you have to know when to make exceptions. This set a precedent, followed by Jews today, to do what you must to survive, even if it temporarily violates some rules, so long as you keep the intention of preserving and passing Judaism on. Without this understanding, there might not have been any survivors of the Holocaust at all. Jesus added to this precedent, extending it to others as well as self, when he healed on the Sabbath. By no means did He make light of the Sabbath, as others accused Him of doing, but the life and well-being of the person healed matters more to God than even His own rules. His response to His critics, “The Sabbath was made for Humanity; Humanity was not made for the Sabbath” reveals God’s intention. He intended a day of rest not as some meaningless ritual but as a life-saving break for human beings. Because our most virtuous, admirable people can take it too far, and feel guilty about ever resting and reflecting, and need a rule to make it okay. For that reason God even went so far as to still Himself on the seventh day, not from any need for rest, but to teach us how, as a mother will sometimes lay down with a child that she wants to nap. 42) Then they were joined by a group of Hasideans, mighty warriors of Israel, all of them devoted to the law. COMMENTARY: Hasideans, or Hasidim, means “Pious Ones”. These were a militant religious Jewish sect. At first they supported the Maccabees, and then later withdrew that support, thinking the Maccabees too political. In any case, the Dead Sea Scrolls preservers didn’t think much of the Hasidim, either. 43) And all those who were fleeing from the persecutions joined them and supported them. COMMENTARY: And that’s how revolutions begin. 44) They gathered an army and struck down sinners in their wrath and the lawless in their anger, and the survivors fled to the Gentiles for safety. COMMENTARY: At this point they’re not going against the Gentile invaders so much as the Jewish collaborators. This fits with the post-exilic doctrine that invaders are just the hand of God’s retribution upon those who abandon Him. COMMENTARY: Because Israel and Judea were not just places where Jews lived, but land specifically belonging to the God of Israel and Judea, entrusted to the people but not truly owned by them. 46) they also forcibly circumcised any uncircumcised boys whom they found in the territory of Israel. COMMENTARY: I was appalled at the punishments inflicted on families who had their boys circumcised, but I don’t like the reversal, either. It makes sense in the context of “eye for an eye justice”—they forced us, so we’ll force them. But it’s still conversion by force, which makes a bad foundation for religion. When you have your way by force and fear you convert the adrenal glands, not the heart and mind. Even if the converted eventually do come to believe, that belief suffers from something rotten in its foundation, something not-love, that eats away at the expression of it. I have heard speculation among some Jungians that Hitler made the headway that he did in Germany because Germans had, in their history, been converted to Christianity not by persuasion but by the sword, and so violence invaded their ethics and their concepts of faith. But I would say that problems erupted even earlier than that, in the many religious wars, pogroms, inquisitions, witch-burnings, and other acts of violence committed supposedly in the name of God, that convulsed Europe for centuries. Does this have a parallel in Judea? These events happened a few centuries before Christ. And what He found, in his day, was a religious elite who put the letter of the law above the compassionate spirit of the law, even as they preached compassion. They were as punctilious as Mattathias could ever have hoped for in obeying the least detail, but the spirit of God’s love was not in them. So I feel that 1 Maccabees 2 gives us an important history lesson, but I don’t feel right about taking it as an example of how to live. 47) They put to flight the arrogant, and the work prospered in their hands. COMMENTARY: “The arrogant”, presumably, being those who felt superior for having discarded their “barbaric” eastern ways for Greek westernization. I don’t favor them either; don’t get me wrong. I just wonder if there might have been some better way to confront spiritual colonialism. COMMENTARY: That I’ll give them. I shouldn’t judge, because I doubt if I could have found a better way to do it in that time and place. But I do know that forcible conversion has no place among us today. 49) When the time came for Mattathias to die, he said to his sons: “Arrogance and scorn have now grown strong; it is a time of disaster and violent wrath. COMMENTARY: Ambiguously, he might mean God’s wrath, his wrath, the wrath of their enemies, or all at once. 50) Therefore, my children, be zealous for the law and give your lives for the covenant of our ancestors. COMMENTARY: The survival exception only applies if survival would forward preservation of Jewish culture. If one’s death would accomplish this better, then you do not get a “get out of martyrdom free” card. COMMENTARY: As opposed to A Certain Jew. COMMENTARY: Abraham’s trial was being commanded to sacrifice his only son, only to be stopped at the last minute by the sight of a ram trapped on thorns to sacrifice instead, taken as a sign of God that the command was only a test. It was the willingness that counted, not the act. In this way Mattathias lets his sons know that martyrdom isn’t mandatory—if God gives any sign that they may survive and still fulfill their mission, go for it! COMMENTARY: Joseph was sold into slavery by his envious brothers, and wound up sold to Pharaoh in Egypt, where he rose in the ranks, by staying faithful in prayer (and also by his skill at dreamwork and scholarship) till he became the most powerful man under Pharaoh. This matters because people often thought that if you left your community, by choice or by force, you had to take on the religion of that people. Joseph set a precedent of remaining a Jew even in his one-man exile. COMMENTARY: Not a fan, as I said. But Daddy Mattathias takes this precedent to heart. COMMENTARY: One of Joshua’s spies, and a leading military figure. In many instances he quelled dissention, cowardice, and any other obstacle to Joshua’s authority, for which Joshua gave him a large chunk of property. COMMENTARY: At this point the line of David no longer held a King’s throne, but descendants of King David still led various communities. Mattathias had no idea that his son would someday establish his own non-Davidic royal line! The internal strife this caused left Judea ripe for Roman overthrow. This helped make first and second Maccabees controversial books. COMMENTARY: In the Bible the prophet Elijah, well-known for confronting his nation’s most powerful people about their Baal-worship, was whisked up to Heaven instead of formally dying. Catholics wonder, then, why Protestants find our tradition of Mary’s body being assumed to Heaven (leaving flowers behind in her crypt) so scandalous. It’s not in the Bible because Mary was still alive during the writing of Acts of the Apostles, and in fact Luke used her as a source for both that book and his own gospel. COMMENTARY: These three teenagers are more often referred to by their Babylonian names, Shadrach, Meshach, and Abednego, by which they were known in the Book of Daniel. Nebuchadnezzar had ordered that all in court who didn’t bow down to his statue must be thrown into a furnace heated “seven times hotter” than normal. These youths were courtiers-in-training, but they refused to bow and got chucked into the flames—and yet did not burn. So Nebuchadnezzar took this as a sign that he should have them pulled out again and appointed to high offices. 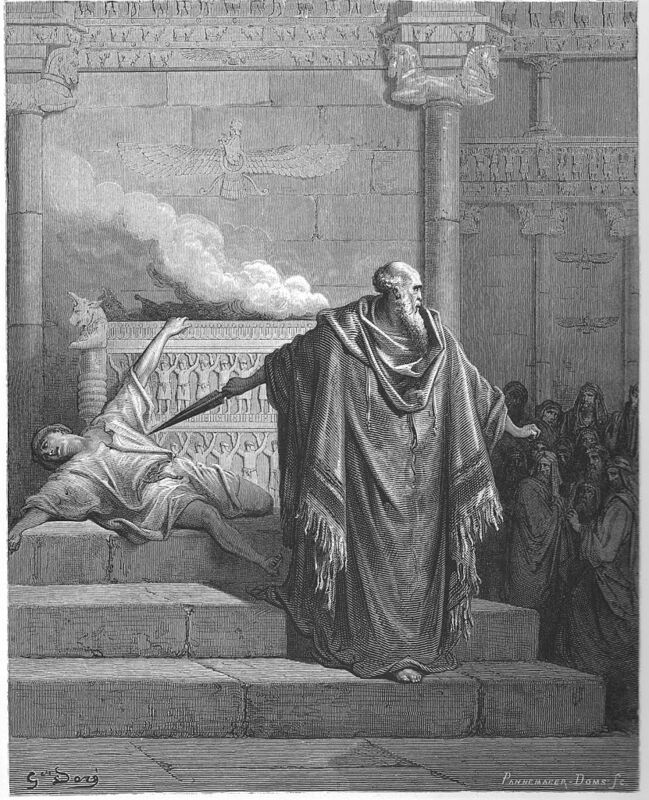 COMMENTARY: Daniel, a friend of the three above and like them inducted into the court, was thrown to the lions for treason, but his only “treason” was worshiping God rather than Nebuchadnezzar (which was fine until some rivals decided to make an issue of it) and so he got thrown to the lions, who showed no interest in devouring him. Again, Nebuchadnezzar fished him out, letting him live to become one of the great apocalyptic visionaries who intrigue and perplex Biblical scholars to this day. COMMENTARY: Strength, at least, if not life. Although Mattathias cites survival stories, he’s realistic enough not to make guarantees that his sons will outlive their service, only that they have that hope. COMMENTARY: This contrasts with the promise of being honored by becoming the King's Friend. 65) “Here is your brother Simeon who I know is a wise counselor; listen to him always, and he will be a father to you. COMMENTARY: Simeon Thassi—Simeon the Guide. 66) And Judas Maccabeus, a mighty warrior from his youth, shall be the leader of your army and wage the war against the nations. COMMENTARY: Judas the Hammer. Much better at war than policy. Hence Mattathias appointing Simeon to take charge of the thinking. COMMENTARY: So now they’ve got marching orders from their father, who’s about to die and become unable to change the instructions. 69) Then he blessed them, and he was gathered to his ancestors. COMMENTARY: Jewish Heaven is seen as being able to be reunited with family, as opposed to those who make an ash of themselves. 70) He died in the year one hundred and forty-six, and was buried in the tombs of his ancestors in Modein, and all Israel mourned him greatly. COMMENTARY: That would be 166 BC. So this would be as recent for Jesus as 1852 for us, if I did the math right (not guaranteed—math is my cryptonite.) This history was still recent enough to have significant impact on Jesus’s generation.